Most entrepreneurs begin their entrepreneurial journey as an unsatisfied customer for the product or service they eventually produce. Read on to learn about some of my experiences as an unsatisfied customer, and my new business serving families with K-8 students. Note the links to separate magazine articles about each business. In 1976, when I began working at Citibank in New York City, I wanted to purchase a summer share in a 12-person group beach house in The Hamptons. But as a 22-year-old math geek who looked age 12, I kept getting rejected when I applied to join the “beautiful people” group houses. So I rented an entire beach house myself and sold summer shares to 11 classmates and coworkers. Four years later, while still working at Citibank, I had a part-time business renting out beach houses to 200 similar “non-beautiful people” which earned me a $1 million cash profit and was featured in an article on the cover of Dallas Life Magazine. In 1981, when I was earning high taxable income, I was offered real estate partnerships with a 3-to-1 tax deduction– each $100,000 invested reduced your personal taxable income by $300,000, “guarantying” an immediate after-tax return exceeding your investment. But as an ex-banker and professor of finance, I knew how bad this “guaranty” could turn out if the underlying real estate failed. So, I started my own company, Zane May Interests, offering myself and others similar investments where the underlying real estate was buildings leased for 30 years to creditworthy tenants. 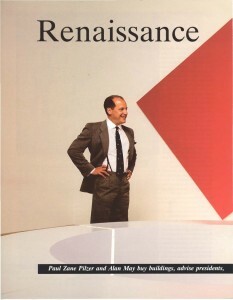 Over the next eight years we purchased $300 million in such assets and in 1989 we were featured in Financial Enterprise, The Magazine of GE Capital. In 1989, before the internet was available to consumers, I became an avid purchaser of CDROMs for my PC–the PC was about to go from a device designed solely to manipulate your own content, to a device that could deliver third-party content. But few of the CDROMs then available had name-brand content or accurate information. So, I started Zane Publishing to publish CDROMs in partnership with traditional leading owners of content. We published a CDROM on every U.S. postage stamp with the U.S. Post Office, on every endangered species with The World Wildlife Fund, and CDROMS on specialized dictionaries with Merriam-Webster and Simon & Schuster. 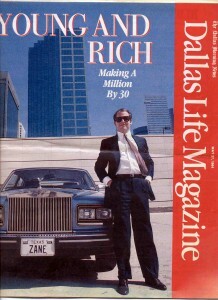 Zane Publishing became publicly listed on NASDAQ in 1995 and was featured in an article on the cover of Success Magazine. In 1999, when my wife was pregnant, my family lost our employer-sponsored group health insurance because we moved out of state. If our daughter was born premature it could have cost us $60,000 a day for 60 days or more. I solved my problem by developing an accounting product allowing the premium on personal health policies to be paid for tax-free by employers. Today, the two companies I founded to distribute this product, Extend Health and Zane Benefits, serve 600,000 American families. 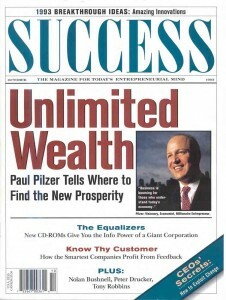 Extend Health was sold in 2012 for $435 million and Zane Benefits was featured on the front page of The Wall Street Journal. In 2005, I became aware of the Utah Electronic High School (UEHS)– offering courses and diplomas completely online but only to Utah residents. This was painful because my oldest brother was a New York resident who had suffered all his life from not having a high school diploma. So I started The American Academy (TAA) to offer courses and diplomas to the approximately 60 million U.S. citizens without a high school diploma. TAA became accredited in 2008 and is today the leading online high school serving former high school dropouts in all 50 states, with students from the U.S. military to thousands worldwide. During the past 37 years, I’ve started six businesses which today employ approximately 1,000 professionals with a current market capitalization of approximately $1 billion–all started because I was initially an unsatisfied customer of the product or service they produced. And perhaps nowhere have my wife and I been more unsatisfied the past nine years than with most of the supplemental math education providers for our four children, currently ages 8, 9, 10, and 12. As explained herein, getting started on the right track in math is one of the most important components of a child’s elementary school education. That’s why, although my family lives in an upscale community with excellent public and private schools, from 2002-2011 we spent tens of thousands of dollars to supplement the math our children learned in school. We tried Kumon learning centers, online computer programs, and individual private tutors–and all except a few private tutors were a negative experience. The earliest and most frustrating learning challenges most children face are in math. These include walking to school (distance), reading a clock (time), making change (addition and subtraction), scoring a soccer goal (angles), and ordering pizza for a party (fractions, multiplication & division). The better a child learns math, the better they learn other academic subjects and the more order they bring to their lives. Mastering math also leads to increased self-esteem. Conversely, children who fall behind in math often have more challenges in life, fall behind in other subjects, and develop feelings of low self esteem. When it comes to learning math there is no upper limit to what a child should learn at their specific grade. Advanced students often have painful experiences learning math in a classroom–because they have either learned the concept before or because they master the new concept faster than their peers. For some students, learning math in a classroom is like being forced to play a video game over and over at a level you mastered long ago. To prepare for high school math, and life itself, every K-8 student needs to master 60 basic math concepts –from counting to exponents. Unfortunately, most schools only periodically report back to parents a single standardized math test score based on a multiple choice test. Such reporting does little to identify the specific concepts a child has learned, what they have not learned, and how the child approached solving each problem. Nor does it value the many hours children spend taking such tests–only to have their worksheets thrown away and their math learning reduced to single numerical score. My wife and I often left these meetings feeling powerless: (1) Because of the way in which standardized tests were administered, our school was unable to give us the specific information we needed to design a program to help our child improve; and (2) If the school had been able to give us our child’s test results, problem by problem, we wouldn’t have known where to get a program focusing on the areas where our child could improve the most. This led us to spend the past two years developing Zane Math which has been used by thousands of students. Zane Math works by assessing what a student already knows, develops customized curriculum for each student, and provides parents and educators with milestones after every lesson demonstrating what has been learned. Our initial success with parents, students, and schools led us to develop a business model to distribute Zane Math called Zane Prep. 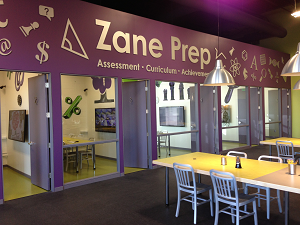 Zane Prep uses entrepreneurs to affordably supplement the education a child receives in school under an Assessment/Curriculum/Milestone model. 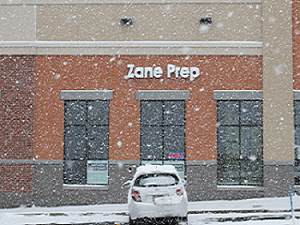 Zane Prep provides K-8 students supplemental education in three types of campus environments: retail stores, in schools after-school, and teacher direct. How does Zane Math work? 1. Zane Math is a 12,000-problem, 60-concept, 12-level math curriculum based on the best Asian and Western mathematics, mapped to the U.S. common core. While Zane Math today is used as a supplemental program, a student completing the 12-levels understands all the math they need to begin high school math. Each level is roughly equivalent to about 2/3 of a year of math and can be completed in five (5) 90-minute lessons with 90 minutes of homework. Click here for more detailed information about the Zane Math curriculum. 2. Zane Math begins with a free 30-minute paper-and-pencil Assessment to identify which concepts a student already knows and the concepts in which they can improve. 3. All Assessments are completed with paper-and-pencil, not multiple choice, and are scanned into the student’s online record as well as computer-scored for comparison purposes. 4. Parents and teachers are able to compare the results online of their student’s Assessment, problem by problem, to other non-identified students in their peer group and community. 5. Once an Assessment is scored and manually reviewed by the Campus Administrator, a 5-week, 5-concept, 100-page, 600-problem Customized Curriculum is produced for each individual student–focusing on the individual concepts in which the student can improve the most. 6. The Customized Curriculum is taught live, in-person, either one-on-one or in small groups of 5-6 students to facilitate peer-based learning and make math fun. 7. Each 90-minute lesson begins with the student taking a 5-minute paper-and-pencil Milestone to measure the student’s knowledge of the prior concept against their knowledge of the same concept in their original Assessment. 8. After every lesson, parents and teachers receive detailed graphs showing progress on each problem, the student’s actual scanned Milestone, and an email discussing the learning of their student. 9. There are hundreds of other unique features, all based on what my wife and I wished we had had as former customers of non-transparent, non-online, supplemental learning programs like Kumon and Mathnasium. For example, Zane Math allows parents to add interested third parties such as grandparents, babysitters or teachers to their student’s online transcript and reporting. The entire Customized Curriculum and Milestones can be printed from anywhere in 10-15 page sections (no more lost workbooks). How can I get involved with Zane Math in my community? 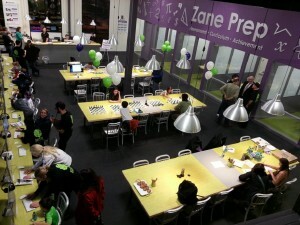 Zane Prep opened its doors to students in September 2012 distributing Zane Math, and we’ve already been joined by some of the most successful educators and business people I’ve known–as employees, investors, and members of our board of directors. Together we expect Zane Prep to make a major difference in education worldwide–starting with the math education of 40 million U.S. K-8 students.. If you are the parent of a K-8 student, or a teacher or entrepreneur interested in helping us improve math education in your local community, click here or the link below to learn more. We also plan to offer a summer internship program in 2013 for college students wanting a meaningful part-time entrepreneurial opportunity.